So What is Health Anyway? For being such a commonly used term, health is a very misunderstood concept. I decided to do a little research to find out what the Confucious of our time, Google, had to say about it. Google has 7,120,000,000 pages relating to health. 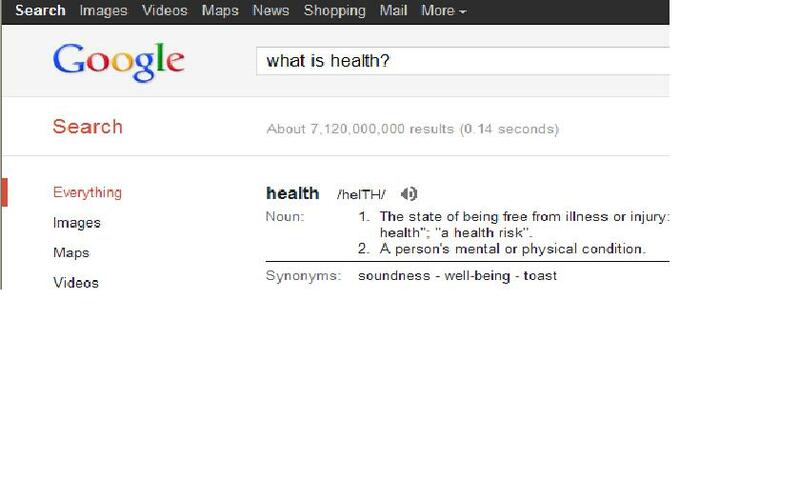 And when I asked Google specifically what health is, Google told me: “the state of being free from illness or injury”, “the absence of abnormailty”, ” the level of functional or metabolic efficiency”. It also told me that Gerber, Nutrisystem, ask.com, and intermountainlive were the deep pocketed sponsors for that page. My flawlessly designed, meticulously executed research confirmed my suspicions: health is a vaguely defined concept that everyone in the world (almost) tries to define and/or sell. It is like religion. Everyone has their own opinion; different religions work better for different people. There is a right level of health for everyone. But it takes time and attention to discover your personal level of health. This is the main concept I have learned during the last year and a half of my schooling. Despite media propoganda, health should not be synonymous with skinny. To suggest that is a very 2-dimensional version of health. Health should be viewed as achieving balance in every aspect of your life. One of the main focuses in my schooling has been based around the above image. As you can see, it suggests that in the center of health is the consumption of high quality water, veggies, grains, fruits, proteins, and oils (in that order). Surrounding a high quality diet, are lifestyle factors: relationships, career, physical activity, and spirituality. 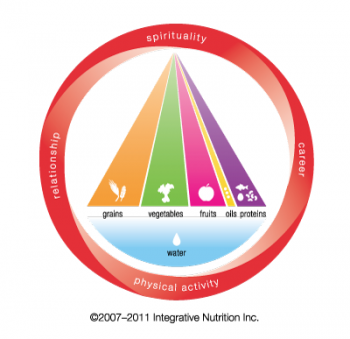 I LOVE this pyramid because it encompases all areas of life, which so many other health regiments fail to do. One cannot achieve optimal health simply by eating a fantastic diet or working out every day. I’m sure we can all think of someone who is so obsessed with healthy foods or their gym time, that it consumes their life. An imbalance in physical exercise or diet leaches energy that should go to other areas of life, like relationships or career. Another huge concept I focus on in my life and with my coaching is the concept of bio-individuality. This is to say that each person has unique food and lifestyle needs. One person’s food is another person’s poison. I have tried and failed many a diet and lifestyle change throughout my life. In the past I even hesitated to fully embrace becoming a health coach because I myself am definitely not perfect in my nutrition. I am most likely the world’s biggest yo-yoer. But the lessons I’ve learned through my health challenges have become as big a part of my education as my schooling. They have helped me to embrace the reality of what being healthy is all about. A common phrase I hear when I talk with people about their health is: “I’m healthy enough”. And perhaps they are. But what we should be thinking is, how healthy can I be? Ask yourself that question as you consider your current health, what you want it to be, and what you can do to get there. Take the whole gambit of health into consideration and it will foster the pathway to a sustainable change. It will make losing weight easier. It will help creating meaningful relationships easier. It will create a happier you. If you have questions about the pyramid or how to apply it to your life, I’d love to answer them – feel free to contact me. I must interrupt my promised slew of summer-themed blog posts to report some very exciting news: THE USDA HAS UNVEILED ITS NEW FOOD ICON! No, no, no I’m not talking about the next Tony the Tiger or adorable talking doughboy. Something MUCH more hip: a plate! 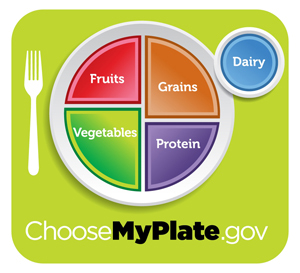 The USDA has been doing some spring cleaning and announced today it will be throwing out the myriads of different food pyramid variations we’ve all been raised on, and will replace it with a cool new icon: a dinner plate. It is designed to help us easily visualize what and how much we should be eating. 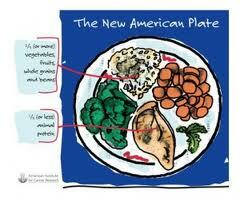 To help buoy up their new icon, the USDA has launched a multi-year campaign to offer Americans one nutritional guideline at a time. The idea behind this, is that we are bombarded with so many nutritional messages, it’s hard to know what to focus on. Instead, this campaign will give us one thing at a time to focus on. 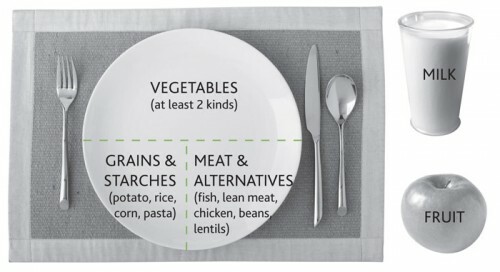 Right now, the tidbit of information is: “Make Half Your Plate Fruits and Vegetables”. So is the new nutritional icon we’re about to be inundated with, a sound nutritional guideline? It’s definitely a good start. The American Institute for Cancer Research has been using a similar model for some time now. Canada has as well. Only difference is they stress more veggies, which I would concur with…in my humble opinion. Another cool thing the USDA is trying this time around: feedback. We are all invited to take pictures of our plates and share them on Twitter: http://www.flickr.com/people/usdagov/. Now’s your chance to show off that fancy healthy meal of kale you’ve worked so hard to prepare! For a fun slideshow of how our dietary guidelines have changed throughout the years, check out this website. Our nutritional guidelines have definitely evolved. Whether or not it’s based on politics, expert opinion, or unbiased scientific research is a topic for another blog. But for now, let us enjoy our plates half full of fruits and veggies. Happy eating.